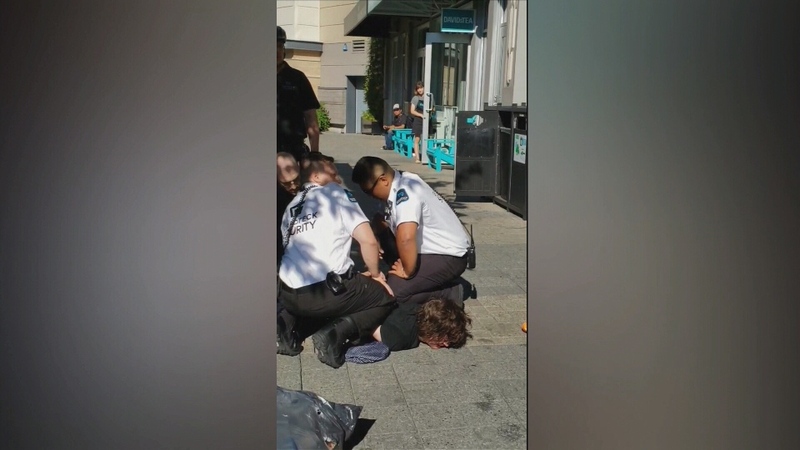 A video of security guards violently taking down a man at a Saanich shopping centre has generated controversy over their use of force. In a nearly four-minute video posted to Facebook, three security guards are seen forcibly arresting a man who had been carrying a garbage bag full of cans. "I didn't do anything!" the man says as he's on the ground. "Why the f*** are you doing this?" A security guard is heard claiming that the man spit in his face, which the man denies repeatedly. At least two guards appear to use their knees to keep the man pinned down on the ground while they handcuff him. "Get the f*** off me! Just let me sit down," the man says before breaking into sobs. "You're seriously hurting him," says the woman filming the video, Kristy Westendorp, who posted it to Facebook Wednesday. The video has since been viewed more than 130,000 times. Westendorp told CTV News Thursday that she posted the video to show what she says was an unacceptable level of violence. She said she and her kids were shopping and stopped to have some ice cream when she noticed a scuffle near some garbage cans. "[It] escalated really quickly into being physical, which is why I grabbed out my camera," said Westendorp. "It ended up with the individual who had the bag of cans on the ground, and ultimately being quite violently restrained by three security guards." She said she's since had contact with the man seen in the video, who told her he was carrying cans he had been collecting throughout the day. "He had grabbed a few out of the garbage to add to his bag, and the security guard was trying to confiscate his whole bag of cans, even though they weren't all from Uptown," she said. "He was trying to hold on to them, so that's where things escalated from there." Westendorp said she was "horrified" by the actions of the guards, which also upset her kids and others nearby. "I would say that there was no reason that they needed to touch him at all or have any kind of physical altercation, but especially to that extent," she said. "He was bleeding from multiple places, he was bleeding form his mouth and his face, and they were putting a lot of pressure on his neck and his back." Once police arrived on scene, Westendorp said officers were able to help calm down the situation. "The Saanich Police, I have to say, did an excellent job of de-escalating the situation, which I was surprised and delighted to see that they were very compassionate. They listened to what I had to say about what had happened, they helped the young man up immediately upon arriving," she said. 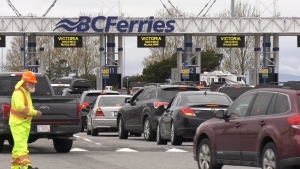 Saanich police haven't issued a formal news release on the incident, but have told CTV News they are investigating both the actions of the guards and the man. Guardteck Security Corp., the company that contracts security services out to Uptown, justified its employees actions – saying the man wasn't permitted on the property due to his past actions. "The person detained has a history of violent action in the mall, including assault, theft, damage to property and mischief. He has been legally banned from the premises," the company said. "When he was approached by our staff, he immediately became agitated and assaulted one of our officers. The ongoing safety of customers and our staff is always a top priority, so he was detained until police arrived." A manager for Uptown Mall supported the security company's position, saying the man was legally banned from the premises. "We apologize to those guests who witnessed an unfortunate incident on [Wednesday] evening at Uptown," the shopping centre said in a statement. "An individual who is legally banned from our site was asked to leave by security and subsequently assaulted the security officer and was detained until police arrived." A criminal lawyer who spoke with CTV News agreed that the video was alarming, but said the man's history with the mall is relevant to how much force guards could legally use. "If the security guards involved were aware of the person's previous history of violence, if any, that would certainly be relevant and inform the amount of force that they might use in order to arrest the person to await the police arrival," said Michael Mulligan of Mulligan Tam Pearson. Whether the use of force was justified is a debate that has attracted plenty of commentary online, with many people calling out Uptown and threatening boycotts. So far, police have not made any arrests.